Maria’s one of the other Luna alumni who got picked up at the same time I did. She’s done a kind of splendid shooting star rise, reaching the NYT with first book, and going on to take the YA world by storm since then. –actually, that’s one of my problems with the book, I think. The romantic interest pretty much comes across as a jerk, and I not only never warmed up to him, but I didn’t really believe Avry doing so either. Particularly since there’s a much nicer alternative. I know too many writers to buy out of loyalty anymore. 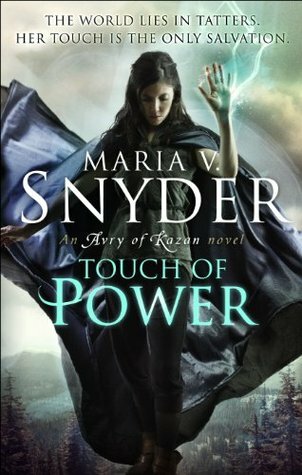 :) Although, actually, I've liked the others of Maria's books I've read. This one just fell flat for me. The romance aspect was actually the really big reason that I never continued with the series, despite really liking the Study series. I've never been one to buy into the whole "jerk = hot" mentality and there's just no way that I was able to buy into the two of them considering how awfully he treated her. I liked the book a little more than you did, I think, but not nearly as much as I did her earlier work. Like you, I suspect I am not her target audience for this one (although I do read and enjoy a lot of YA and even some middle grade). Her "Study" books, however, knocked my socks off when I read them. I remember reading the first one (Poison Study, I think), and putting it down when I was done, thinking, "DAMN, I will NEVER be able to write like that." Also, Maria is a sweetie. I've met her at RWA conferences, and she is always a pleasure to be around. Your mileage may vary but I liked the second book in the series much better. But then after the Opal books (which I read all of though I never actually LIKED the main character) having interesting characters that I didn't want to thump was a blessing.